"All great coaches have this one thing in common. They understand that you get what you demand, not what you request," she told me. "They know how to absolutely insist on a certain standard every single day, and they do not accept anything less -- regardless of whether a team is old or young, no matter the circumstances or the personalities of the players." One of my absolute favorite quotes I first heard from Bob Pruett, the former Marshall football coach. It is one a keep in a prominent place in my office and read often. It is one that I will share next week with our team coming off a very good season. For those that find success and hold dear to this philosophy that have a chance to continue. This is how the good become great. It is how teams repeat as champions. It is the formula for growth -- on the court and off! It's not so much amazing to me any more as much as it still remains very disappointing that coaches and programs remain out there that choose not to share. As I have stated often on this site, I am who I am because of some great coaches that have passed a long a lot of knowledge. Someone once stated of Bob Knight that "the one that cheated the least, won the most." I'd like to paraphrase that in speaking of Coach Meyer in that "the one the shared the most, won the most." There are no secrets in this game. But as coaching continues to improve there arise fresh ideas on old theories...a new drill to teach an old phase of the game. Coaches should do all they can to help each other. Leadership finds its source in understanding. To be worthy of the responsibility of leadership, a person must have insight into the human heart. Sensetivity toward the hopes and dreams of people on your team is essential for connection with them and motivating them. Talk show host Larry King said, "I remind myself every morning: nothing I say this day will teach me anything. So, if I'm going to learn, I must do it by listening. A Cherokee proverd says, "Listen to the whispers and you won't have to hear the screams." Good leaders are attentive to small issues. They pay attention to their intuition. And they also pay close attention to waht isn't being said. David Burns, a medical doctor and professor of psychiatry at the University of Pennsylvania, points out, "The biggest mistake you can make in trying to talk convincingly is to put your high priority on expressing your ideas and feeling. What most people really is to be listend to, respected, and understood. The moment people see that they are being understood, they become more motivated to understand your point of view." Former Chrysler chairman Lee Iacocca asserted, "Listening can make the difference between a mediocre company and a great one." 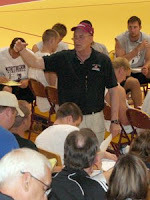 Coach Schilling runs the Champions Academy in Indianapolis. They have had six NBA first round draft choices from Indianapolis the past two years and he has worked with five of them. He played at Miami (Ohio) and broke almost every assist record playing alongside Ron Harper. He has coached high school and was the Men's Coach at Wright State. 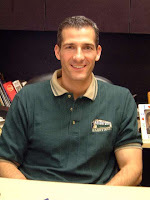 He has been an assistant with John Calipari at UMass, Memphis, and with the New Jersey Nets. For so many that keep checking back to the blog for updates, my sincere apology. The rigors of our stretch run has dominated my workload and allowed for little or no time for the blog. If possible I will try to get some stuff up in the next few weeks but promise to be back running full-time at season's end.